Feiss Marcella 1lt Floor Lamp 1 x 60W E27 220-240v 50hz Class I. Russia, Malta, Australia, New Zealand, Asia, USA, Guernsey, Jersey etc. Blending influence from Prussian tradition to Arabic art, the unique Marcella series creates an imposing look of ornate filigree finished in hand applied bronze and gold patina. These substantial pieces have amazing attention to detail and will make a statement in any situation they are placed. The pendant fittings include a bottom glass diffuser. Max Wattage: 1 x 60W E27. Order before 11am for same day dispatch. Does not apply to all products. We will advise you once the order is placed. This product has no reviews yet, however see what our buyers say about our other products.. Your item will be professionally & carefully packed and despatched in a timely manner. Sign up to our mailing list to hear about our great offers. The item "Feiss Marcella 1lt Floor Lamp 1 x 60W E27 220-240v 50hz Class I" is in sale since Monday, September 11, 2017. 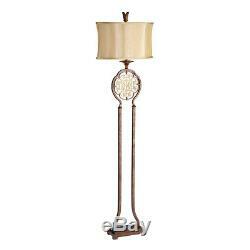 This item is in the category "Home, Furniture & DIY\Lighting\Lamps". The seller is "liminaires" and is located in London.